A stunning addition to any bedroom suite, our beautifully handcrafted Fairview Chest of Drawers features the timeless looks of a classic Mission piece, combined with generations of woodworking technique to ensure a storage piece that will look great for a lifetime. 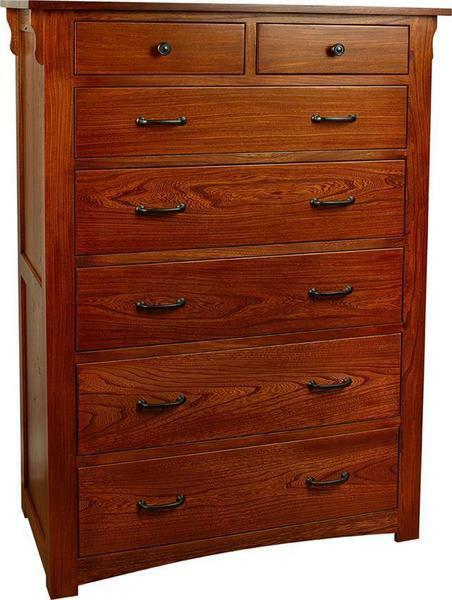 The large stature of this chest is sure to make a statement on any bedroom you choose. Complete with seven spacious, flush-mounted drawers, you'll have plenty of room to store your bedroom items - ensuring easy access to anything you need when getting ready for the day ahead. On the sides of the piece, large reverse panel sides and classic Mission corbels add the right touch of antique style, while displaying the natural grain patterns and warmth of the hardwood. Customize a Fairview Mission Chest to fit any space by choosing from five different wood species, each one available in an array of finish options, to ensure you get the perfect complement to your existing decor. The classic hardware adds a beautiful touch to the piece, but you can also opt for a different hardware collection to add your personal touch to the finished look. We purchased a tall, large, seven-drawer dresser and a custom king-size bed with shelves at the headboard and 6 drawers underneath. They seemed rather expensive when we ordered them, but when we got them, we were ASTOUNDED at the quality! They are worth every penny, and more. Everything was better than we had imagined it could be. The solid, real-hardwood construction, the joinery, the hinges and sliders, the beautiful staining and finishing - this is truly lifetime heritage furniture. The only complaint I had - and this is why I only gave them four stars - is the delivery time. I had somehow gotten the idea that they would come in two and a half months. It actually took about five months (Probably due to the customizing I had ordered on the bed). Meaning we were sleeping on the floor with our clothes in cardboard boxes for a few months. I might have gotten upset, but when the two pieces were delivered (driven all the way from back East to the Seattle area by a professional mover who does nothing but DutchCrafters deliveries) I was so pleased with the quality that all the "upset" in me got washed away. I just wanted to tell you that the furniture had been delivered. We could not be happier! Each piece is just as we imagined it would be, we have now furnished our entire home with Amish made pieces and are just so grateful. These are pieces that will be handed down to children and grandchildren. Inside delivery is the best 200.00 dollars we have ever spent, our delivery was on time and the delivery man was ever so nice. Thank you for such a good buying experience!